Dr. Arindam Banik is Associated Cement Companies Chair Professor in International Finance and Business , International Management Institute, New Delhi and holds a Ph.D Degree from the Delhi School of Economics, Delhi University, India. He started his career as Junior Executive, American Express Bank, Dhaka, Bangladesh in their Foreign Exchange Department during the period 1982-1986. Prior to joining IMI in 1994, he was with the Delhi School of School as Research Fellow for six years. Dr. Banik was with the Department of Economics at the University of West Indies, Cave Hill Campus, Barbados (West Indies) as Visiting Professor (offered indefinite tenure ship) for the past four years (2001-2005) and has returned to India in July 2005. Dr. Banik’s research interests include financial sector and economic growth, international finance and foreign borrowing, trade, investment and competitiveness, measurement of poverty and policy implications, impact and assessment study of public expenditure, technology transfer and multinationals, Joint Ventures and nature and impact of global finance. He has published articles in reputed national and international peer-reviewed journals. Dr Banik is the Editor of Global Business Review, published by Sage publications. This journal is considered as one of the most reputed management journals in Asia. Author of two books published more than 100 scientific articles on international economics, macroeconomics and economic development. He is the recipient of prestigious SANEI ( South Asia Network of Economic Research Institutes) Research Award to study on, “Trade in Health Services in South Asia: An Examination of the Need for Regional Co-operation”, and SANEI Research Award under Asian Development Bank-ADB RETA 6417 to study on, "Measuring the Barriers to Trade in Services in South Asia: An Empirical Exercise", January –October,2009. 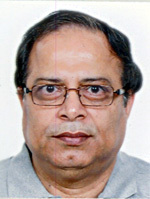 He is also the recipient of several awards and honors including Campus Research Award for three consecutive years ( May 2002 and 2003), University of the West Indies, Cave Hill Campus; Visiting Scholar, Centre of Asian Studies, The University of Hong Kong, Hong Kong; ACC Chair Professor in International Finance and Business, International Management Institute, New Delhi; Visitor, Department of Economics, Cambridge University, Cambridge and London School of Economics , London; AMDISA Research Fellow; Visiting Fellow, Manchester Business School, University of Manchester, United Kingdom; Indian Council for Cultural Relations Fellow, Delhi School of Economics, University of Delhi ;Wirnock International( USA) Research Awardee, Delhi School of Economics, University of Delhi .